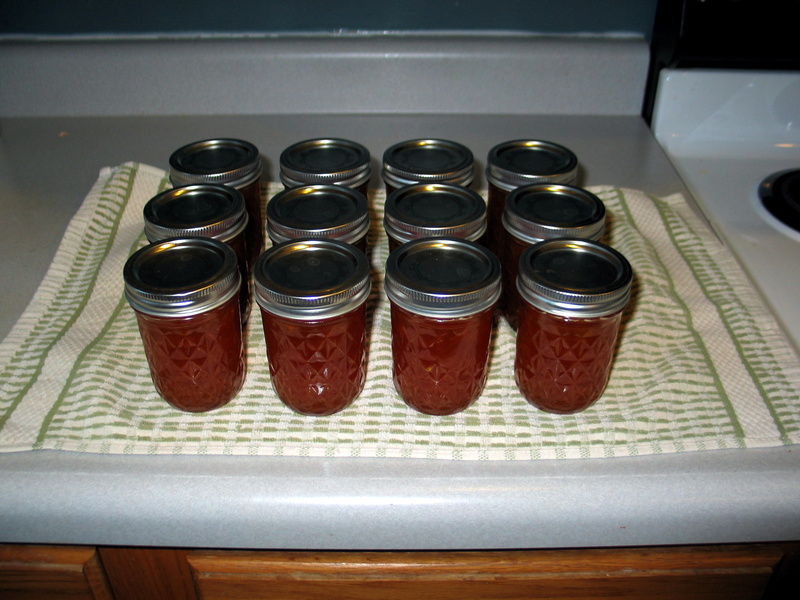 Last weekend, I worked up a batch of grapefruit marmalade. The story isn’t very special. The production took longer than I expected. 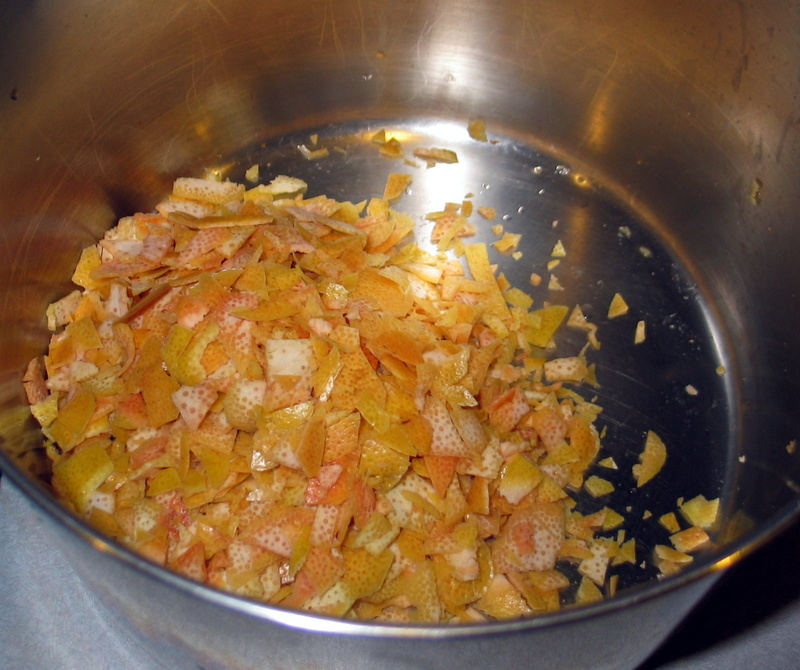 The finished marmalade was passable, but not awesome. 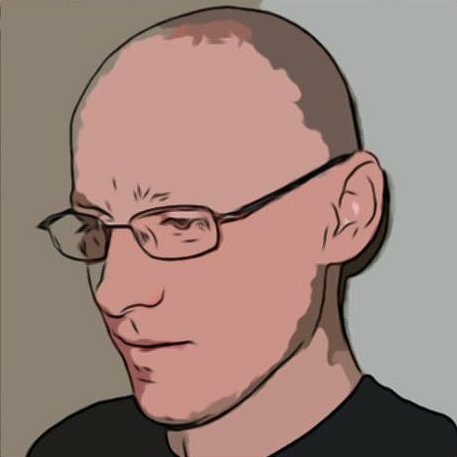 No – there is nothing compelling here at all. But I enjoyed myself and took pictures, so there has to be a blog post! Believe it or not, my marmalade recipe is from Martha Stewart. Yep – me and Martha. 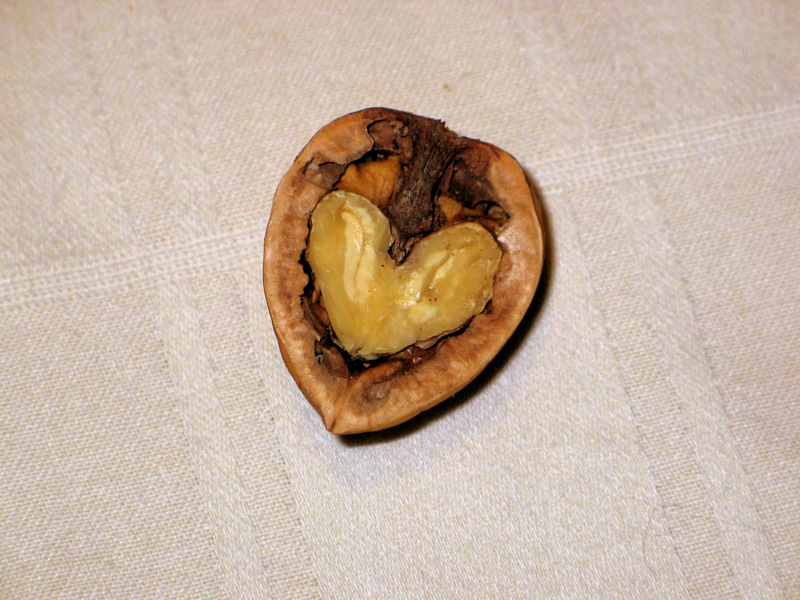 As close as two seeds in a hesperidium. * Flavedo? Albedo? Huh? 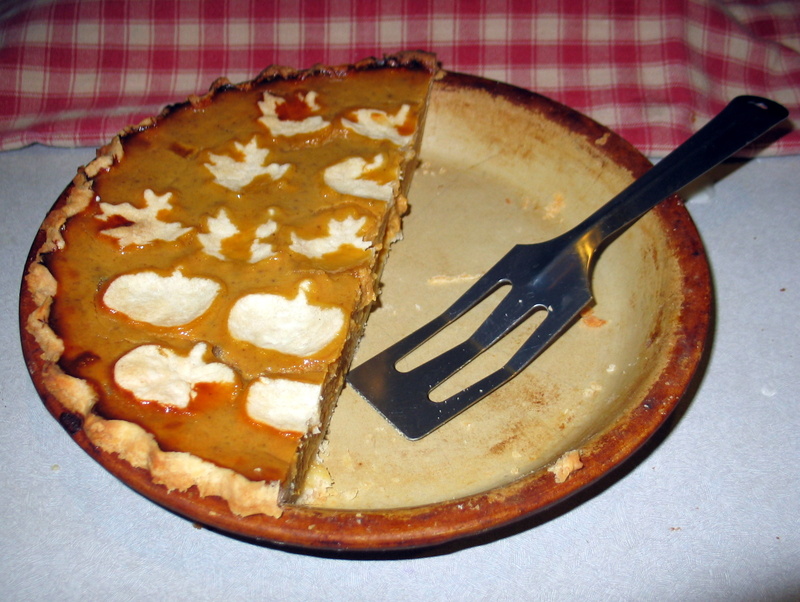 Ok – zest and pith, if you like. 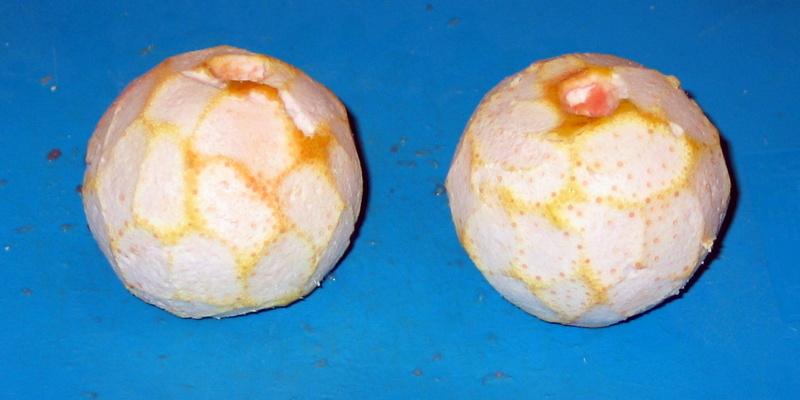 After removing as much of the pith as I could in a reasonable amount of time, I sliced the fruit into thin sections, removing seeds as I went. This all went into the pot with the zest and six cups of water, and got boiled for twenty minutes or so to tenderize everything. After the initial tenderizing, the recipe calls for four cups of sugar. At this point, I realized I had a problem. 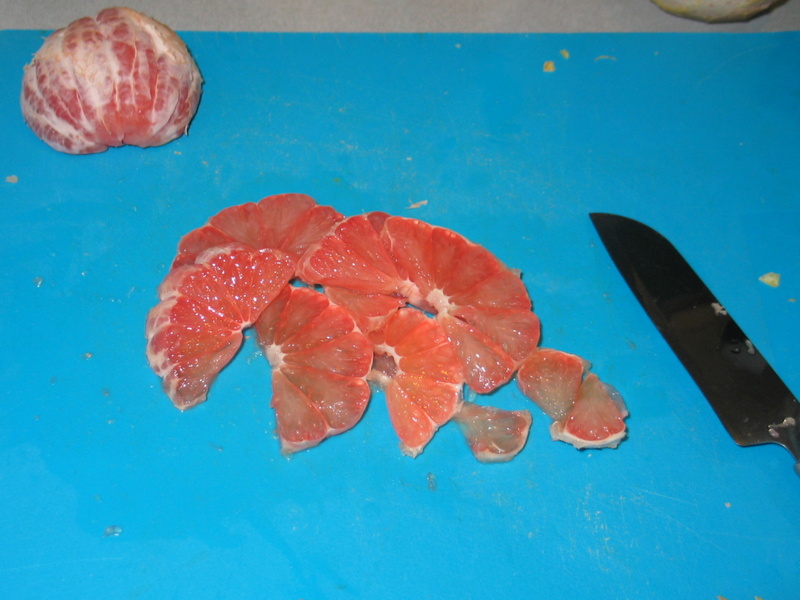 Turns out, grapefruit aren’t quite as sweet as clementines. (No kidding! Who invited the scientist to this party?!) 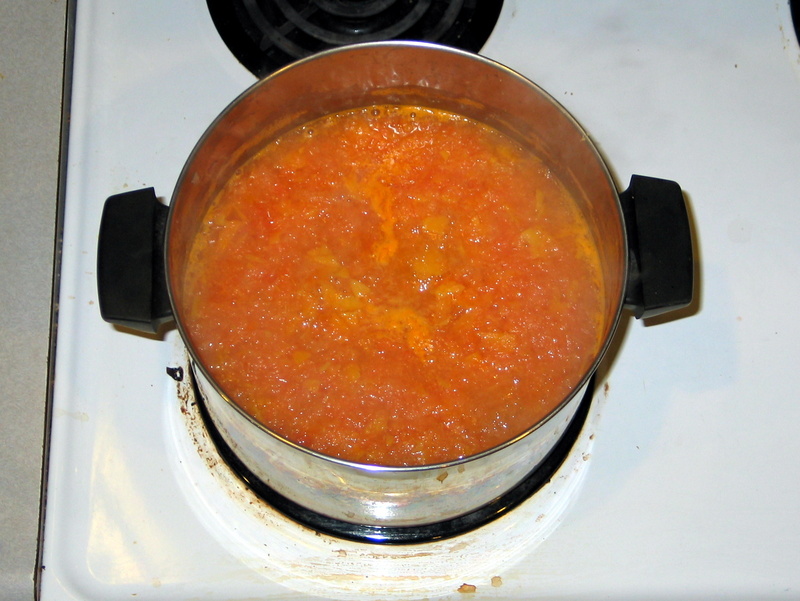 Since the final step in this marmalade-making process was to simply boil until things thickened up, I thought I’d cook for a while and see if the flavor might improve as things concentrated. Uhh… no. After twenty minutes or so, I decided to add more sugar. And finally I had added all of the sugar in the house. But just because the taste was right didn’t mean an end to the process. 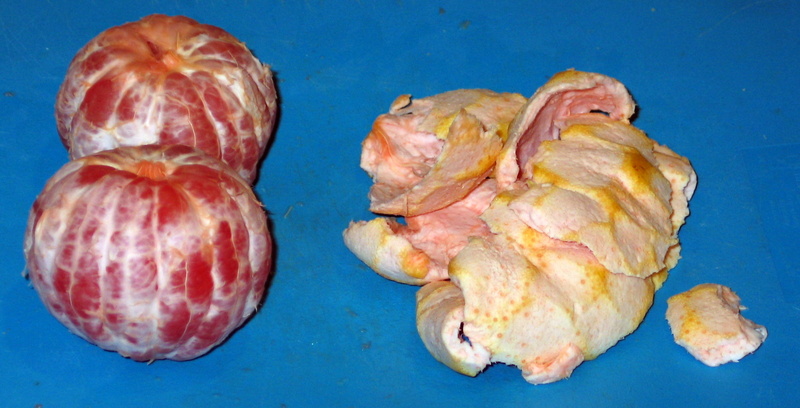 The mix was still much too thin, so I continued to cook things down – probably for a total of two hours or so. Much longer than the 45 minutes in the recipe. Eventually, I concluded that proper consistency had been reached… that or I just got tired of waiting. 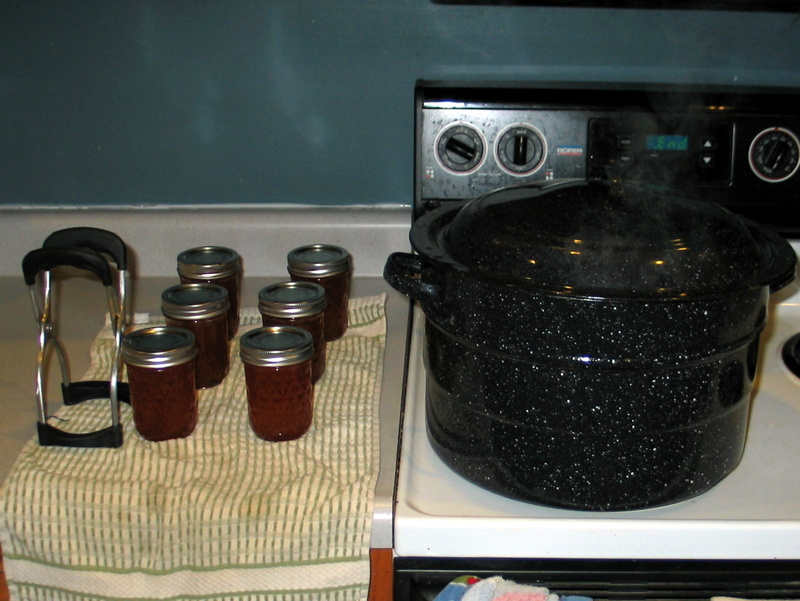 It was way after our bedtime, but Long-suffering Spouse had stayed up to show me how to run the canner. Final tally? 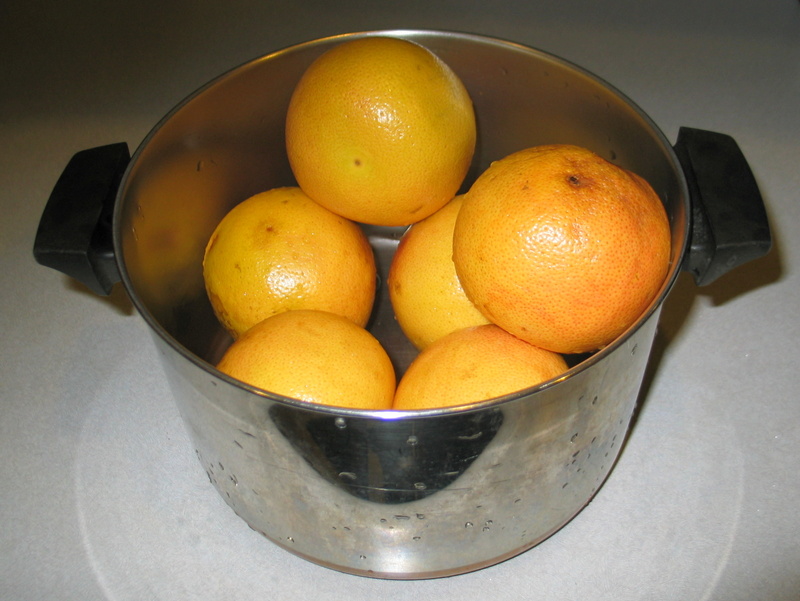 Three quarts of marmalade! Well – it’s the beginning of another work week, but I wanted jot down some thoughts on this past weekend, in case I ever want to remember it. So am I a real Mennonite now? * I may eventually get around to blogging about the book. In the meantime, I’ll just say that I like it. It’s challenging and very readable. Follow the link in order to learn more. ** I think I got those right, but I didn’t jot them down during the sermon. So why is it that I’d begin telling about my weekend by starting in the middle? Because on Saturday, I partook in all four of those examples at the Michiana Relief Sale in Goshen, Indiana. I don’t know if anyone else would find that amusing, but to me it felt a bit like the beginning of Lent. Saturday was the equivalent of Mardi Gras: Menno cultural extravagence. And Sunday was like Ash Wednesday: getting back to the ‘bare essentials’. Much to many people’s astonishment, this Relief Sale was my first. Now – to those of you who aren’t culturally Mennonite, that won’t be anything earthshaking. But for someone who is as culturally Mennonite as I am, it’s a bit surprising that I’ve made it this far through my life without getting to one. For example, my sister estimated that she has been to about fifteen of these. And my wife has been to Relief Sales in four different locations. Yes – they happen all over the place. 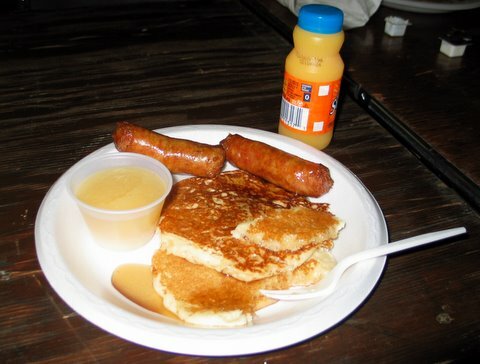 We missed the Friday evening events while we were travelling from Illinois to Indiana, but we got up in time to eat breakfast at the sale on Saturday. 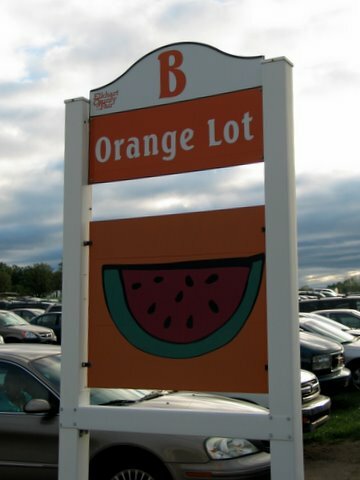 When we got to the fairgrounds we parked in the orange lot… which is distinguished by a picture of a watermelon! Go figure. Since this was my first sale, I don’t claim to speak with any authority, but it would seem that getting there for breakfast on Saturday is a ‘must’. 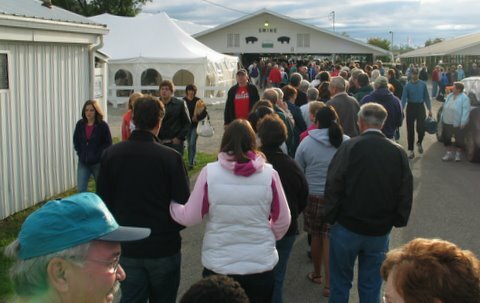 Here was the line for the ‘all-you-can-eat’ pancakes. And here is my breakfast. 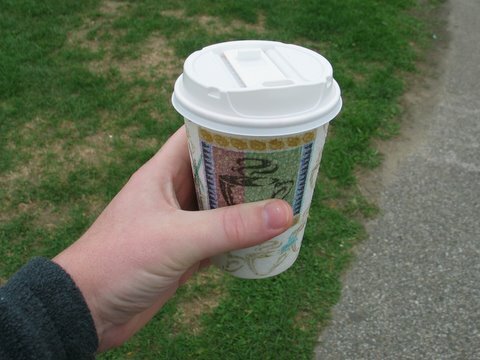 It was a cold day, so I washed that down with a mocha, courtesy of the Electric Brew. 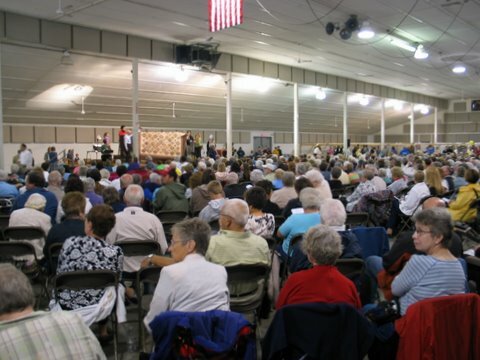 And from there on, I spent most of the day at the quilt auction. As far as I know, the highest price paid for a quilt on Saturday was $5000. On Facebook, one of my cousins expressed some incredulity that I’d enjoy watching people buy quilts. But I actually had a great time, in part because I just like auctions. It’s always fun to try to understand the incoherent jabbering of the auctioneer and to watch the crowd’s enthusiasm when the bidding gets competitive. I saw friends from Illinois, Indiana, Michigan, and Pennsylvania. I stopped counting at fifteen while I was still in the breakfast line. My daughters took train and elephant rides. I had a pecan pie for lunch. And that’s about it. According to my wife, that’s all it ever is: food and auctions. Back in high school choir, the choir members had outfits that required fitting. I distinctly remember going to the store that was doing this and being told by one of the employees, “You’re a bit chubby here!” I considered that to be insulting and rude, and I never went back to that store. During my undergraduate time at Goshen College, I spent one semester in Costa Rica. During that time, my eating habits were excellent and the food was healthy. I lost quite a bit of weight – don’t really know how much, but while I was there I had to put new holes in my belt to get it to fit my waist. When I came home, I took up biking during the summer. That was a good time for me. When I started grad school, I had just gotten married. I also purchased a bread machine about that time. Not good. Well – the bread was good, but its effects, combined with my lack of self-control and my wife’s great cooking, made for a steady weight gain. Midway through grad school, I was about 45 pounds over my target weight, and I determined that I was going to do something about it. I ate less, I ate healthier, and I started exercising. I biked to work, went swimming in the mornings, and took up jogging. I actually got to the point where I was losing half a pound per day, and it was healthy weight loss. I wasn’t starving myself or anything unhealthy like that. I just did a major re-adjustment of my eating and exercise habits. And I got down to a healthy weight. Then my first daughter was born, and my discipline disappeared. About five years later, I had put nearly all of the weight back on. At this point, we had moved on and I had a postdoctoral research job. Happily, there was an Olympic-sized swimming pool at the lab where I worked, and I got myself back into some healthier habits, and got my weight back to a healthier level. And then my second daughter was born and we moved to our current house, and after about five years my weight was going way up again. Well, I’ve put back on most of the weight I’ve lost. Really – it’s one of the biggest challenges to self-esteem that I face*, so I’m working at self-control again. I need to reduce the food that I’m eating, and I need to get back into the swimming pool. (I love swimming, although I wish the water at the ‘Y’ were a bit warmer.) Staying in control of my diet and activity level is such a weakness for me. But I thought that if I shared here, it might provide a bit of incentive to keep working, especially with the upcoming holiday season. * I realize that we could discuss self-esteem and self-worth, and where those feelings come from, and what they should be based on, and so forth. But it doesn’t change the fact that I need to modify my lifestyle. Which is to say – I guess I don’t particularly care to discuss those thing right now. So – watch this space for updates. Perhaps I’ll reflect on other aspects of this journey that I haven’t mentioned here, such as the quality of food that we eat or the issue of justice and global nutrition. And I’ll appreciate any prayers for discipline and gentle accountability nudges. And one more drink. This one comes with a story.